Take big bowl. Put basen and rice powder. Mix well. Heat oil in a pan for deep fry. Drop the batter slowly with your fore fingers, fry in a medium flame until the pakodas turn golden brown. Remove and drain them on paper napkin. 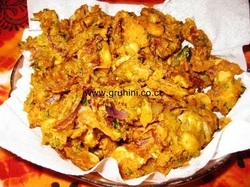 Yummy crispy Kaju Onion Pakoda is ready.............You can have them as an evening snack with tea or coffee. 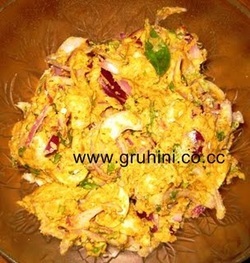 You can also store this in a air tight container for 2 to 4 days.